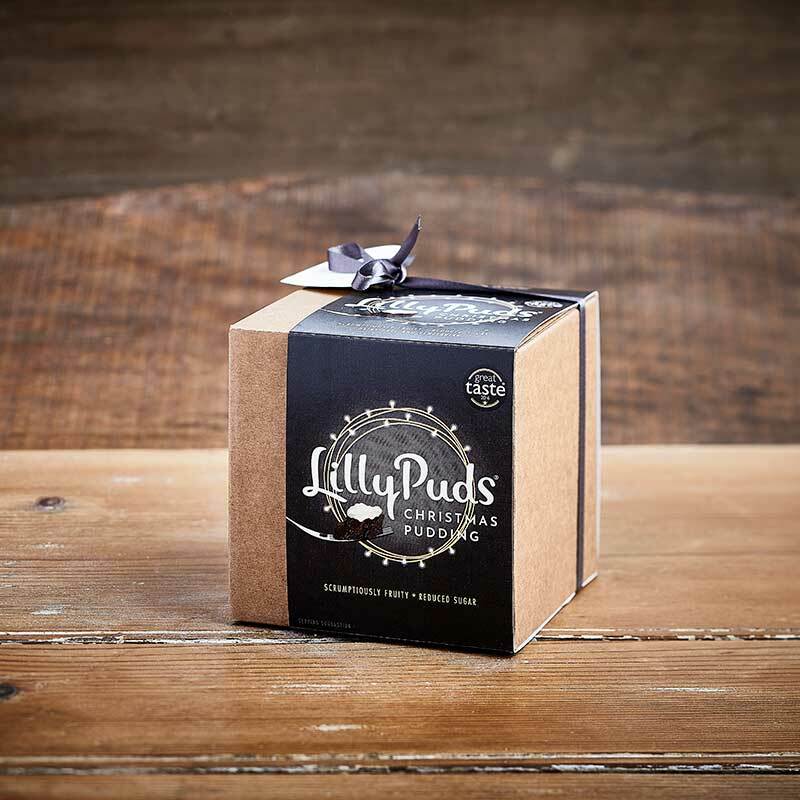 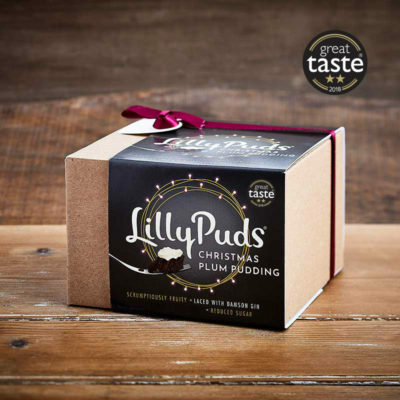 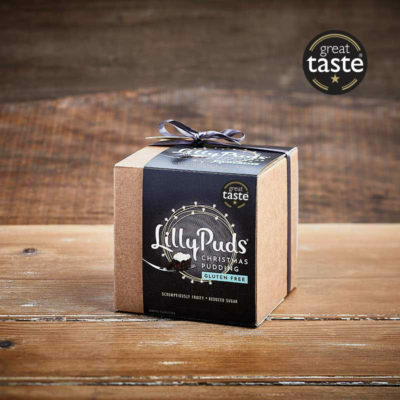 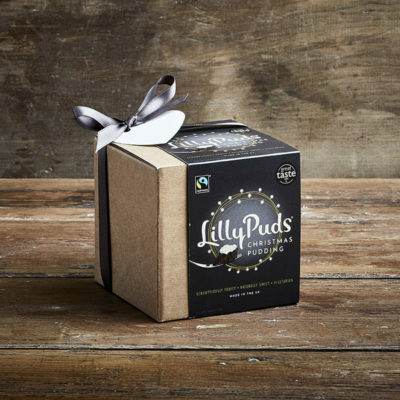 LillyPuds premium traditional Christmas pudding – finest vine fruits, apples, apricots, almonds and ginger blended with ale and brandy. 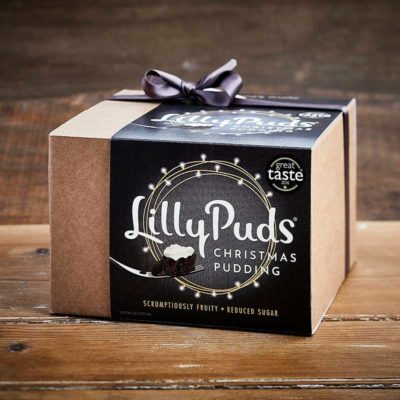 Vine Fruits (34%) (Sultanas, Raisins, Currants), Gluten Free BBC Chockwork Orange Beer (10%), Apple (Apple, Anti-oxidant: Ascorbic Acid), Pasteurised Free Range Whole EGG, Non-hydrogenated Vegetable Suet (Responsibly Sourced Palm Oil, Sunflower Oil, WHEAT Flour (Calcium, Iron, Niacin, Thiamin)), Ground ALMONDS, WHEAT Flour (Calcium, Iron, Niacin, Thiamin), Glace Cherries (Cherries, Glucose Fructose Syrup, Acidity Regulator: Citric Acid; Colour: Fruit and Vegetable Juice Concentrate), Stem Ginger (Ginger, Sugar), Un-Sulphured Apricots (Apricots, Rice Flour), Dark Muscovado Sugar (Sugar, Cane Molasses, Colour: Plain Caramel E150a), Breadcrumbs ( WHEAT Flour (Calcium, Iron, Niacin, Thiamin), Water, Yeast, Salt, Emulsifier: E471, E472; SOYA Flour, Preservative: E282; Rapeseed Oil, Flour Treatment Agent: E300), Brandy (3.0%), Orange Juice, Orange Zest, Lemon Juice, Mixed Spice, Lemon Zest, Nutmeg, Ground Ginger. For allergens, including cereals containing gluten see ingredients in BOLD above. May also contain sesame.